Hornworts are a group of bryophytes, or non-vascular plants, comprising the division Anthocerotophyta. The common name refers to the elongated horn-like structure, which is the sporophyte. The flattened, green plant body of a hornwort is the gametophyte plant. 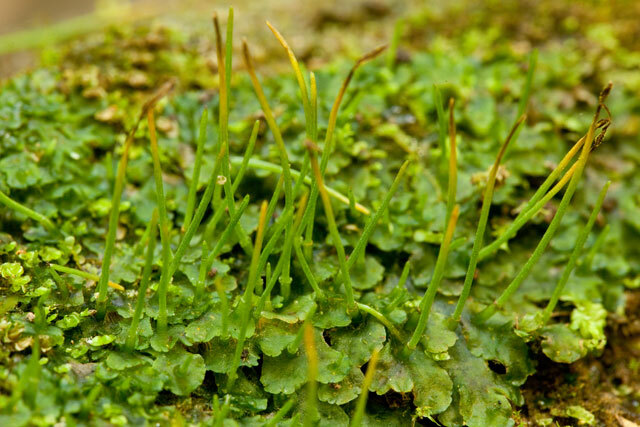 Hornworts may be found worldwide, though they tend to grow only in places that are damp or humid. Antheros sp. Photo: Jason Hollinger 2007. Source: Wikimedia Commons. Phaelaev sp. Photo: Bob Klips 2009. Source: Wikimedia Commons. Spores are visible the in the emerging gametophote. Photo: Curtis Clark 2012. Source: Wikimedia Commons. Illustration: Lady of Hats 2005. Source: Wikimedia Commons.